There are dozens, if not hundreds, of species of plants cultivated for their flowers. Their purposes are familiar: to decorate homes, to celebrate weddings or to offer condolences at a funeral. Some flowers, such as dahlias and numerous orchids, are native to South America. Others, such as hibiscus, are imports, having originated elsewhere, but now established. Flowers in a city market provide a useful income for local gardeners and a means to brighten up city life. This picture gives some idea of the range of different types of flowers available. 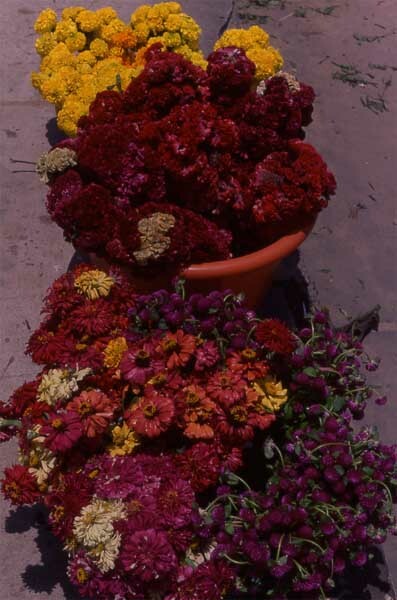 In the upper right are marigolds, in the bucket are cockscomb, and from middle to lower are several types of dahlias. This plant is as useful as it is beautiful. 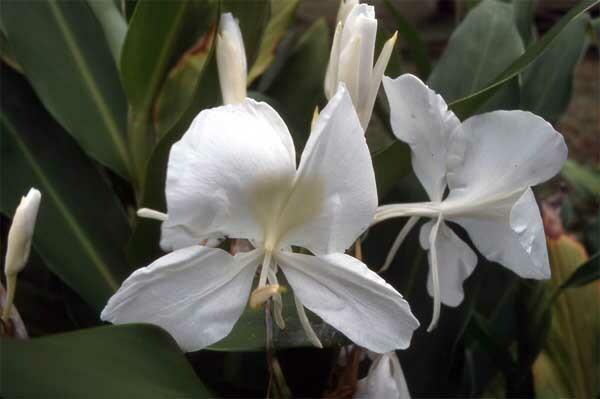 According to the Amazonian Ethnobotanical Dictionary, the butterfly lily (Hedychium coronarium) can relieve aches and pains, and is used to fight against rheumatism and tumors. Also called Amazon lily, it is neither a lily nor from the Amazon. It is actually related to ginger (see ginger flower). It is commonly cultivated in the Amazon but originates from India, and has spread throughout the tropics. In some parts, notably Hawaii, it is a serious weed. 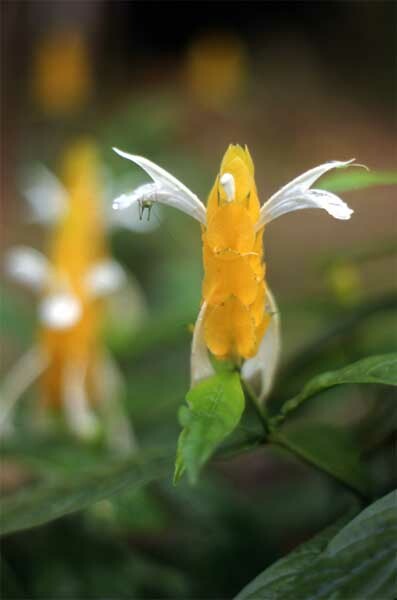 The lollipop plant (Pachystachys lutea) is a small shrub cultivated for its flowers. Note the tiny katydid hanging upside down from one of the petals.